Talk about ultimate sweet comfort dessert! And yes, they really are from a diabetic cookbook. If you're not big on adding the raisins and walnuts, leave them out. As you can see, I made a half and half batch. 1. Place the dough on a lightly floured surface and roll into a 12 x 16 inch rectangle. 2. Combine the margarine and cinnamon and stir to mix. Stir in the sugar substitute, then slowly stir in the maple syrup. Spread the mixture over the dough and scatter the raisins and walnuts over the top. Roll the dough up jelly-roll style, beginning at the long end. Cut the roll into 16 slices, each slight less than an inch thick. 3. Coat a 9 x 13 inch pan or two 9-inch round cake pans with cooking spray and place the rolls in the pan, with the cut sides up, spacing them evenly apart. Cover with a clean kitchen towel and let rise in a warm place for 45 minutes or until doubled in size. 4. Bake at 350ºF for 12 minutes or until lightly browned and no longer doughy in the center. Cover loosely with aluminum foil during the last part of the baking if the ring starts to brown to quickly. 5. To make the glaze, combine all the ingredients in a small bowl and stir until smooth. Drizzle over the warm rolls. Serve warm. 1. Place all of the ingredients except for 2 Tblspn of the unbleached flour in the pan of a bread machine. Turn the machine to the "rise," "dough," "manual," or equivalent setting so the machine will mix, knead, and let the dough rise once. 2. Check the dough about 3 minutes after the machine has started. If the dough seems too sticky, add more of the remaining flour, a tablespoon at a time. When the dough is ready, remove it from the machine and proceed to shape, fill and bake it as directed in the recipe of your choice. 1. Combine all of the whole-wehat flour, sugar, sugar substitute, yeast, and salt, and stir to mix well. 2. Heat the milk and margarine or butter until very warm (130ºF) and gradually stir into the flour mixture. Stir for 1 minute and then stir in the egg substitute. Stir in the unbleached flour, 2 Tblspn at a time, until the dough is too stiff to continue mixing by hand. 3. Turn the dough on to a floured surface and knead the dough for 5 minutes, gradually incorporating enough of the remaining unbleached flour to form a smooth, satiny ball. 4. Coat a large bowl with cooking spray and place the dough in the bowl. Cover the bowl with a clean kitchen towel and let rise in a warm place for about 1 hour, or until doubled in size. Then proceed to shape, fill and bake the dough according to recipe directions. INCREASE the cinnamon! I used the Vietnamese cinnamon which is stronger, but with only 1/2 tsp called for, it just wasn't enough - you can barely taste the cinnamon. I warmed up the margarine/cinnamon/sugar substitute/maple syrup so it was a nice liquid consistency making it easier to spread over the dough. I did half with no raisins/nuts and the other side with. Both are good, so it's entirely up to you. A friend recommended using currants in place of raisins since they are good for your heart. Next time, I'll give it a try. 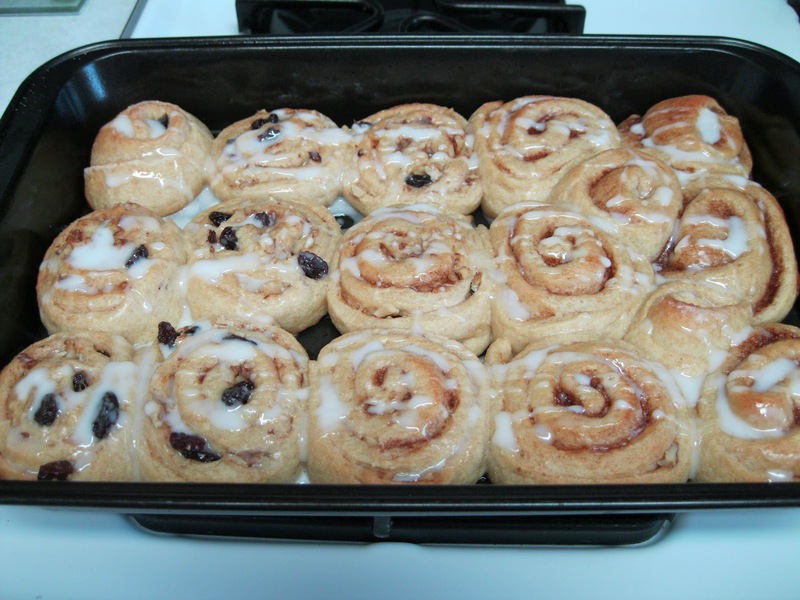 I think of cinnamon rolls having a thick white glaze. Unless you have clear vanilla, your glaze is going to look a very light brown color. Since that's not what I wanted, I skipped the vanilla. Welcome MB - great to have you join us! I love the KA Baking Circle - what a supportive group! Happy baking/cooking to you too!